My girls and I made 2 dozen cupcakes for Daddy's birthday today so this post is very fitting! 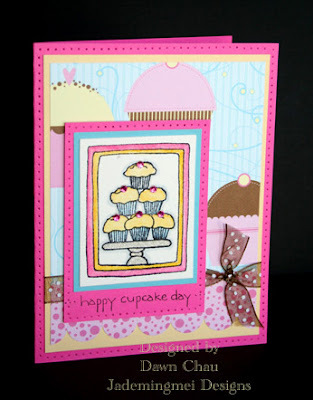 My dear friend sent me this cupcake paper and I was waiting for the right time to use it! The cupcakes are rather large and I didn't want to cover up too much of them so I grabbed my Karen Lockhart cupcake stamp and went to work. The cupcake image is colored with color pencils and SU! re-inkers. I covered the cupcake platter in silver gel pen then overcoated with my Stardust gel pen...very sparkly! I traced the image with my soft grey copic marker and added some Amuse Twinkle stickles to the tops. The ribbon is from May Arts and PP is Heidi Grace. I haven't had too much trouble with these copic markers bleeding, even though I'm using Black Stazon ink. I have found that if your not tracing an outline DIRECTLY on the ink, then no bleeding occurs...just pull your marker brush tip out a little bit and VOILA! A Cool Discovery AND BIG NEWS!! !